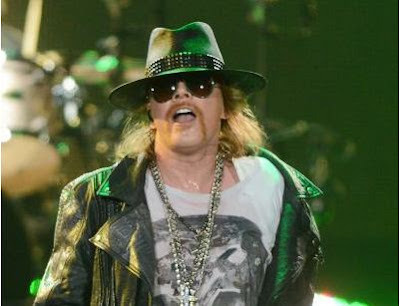 Officials say Guns N' Roses frontman Axl Rose was robbed of three gold-and-diamond necklaces worth over $200,000 after the hard rock band's concert in Paris. A Paris police spokesman said that the lead singer of the Rock and Roll Hall of Fame band - Axl declined the Hall of Fame induction - was fuming after the theft. Whoever robbed Axl Rose is believed to have done so during a private gathering after the band's show at Bercy stadium the previous night, the police said. Axl Rose should really have a cameo in Rock of Ages. Judicial police have opened an investigation but the spokesman said it didn't appear that Rose was wearing the necklaces at the time his bling was pilfered. The spokesman spoke on condition of anonymity because of office policy. The GNR website says that they are scheduled to play in Moenchengladbach, Germany, before returning to France as part of a tour of Europe and Israel. The tour runs through July 22. Use the safe between now and then, Ax.